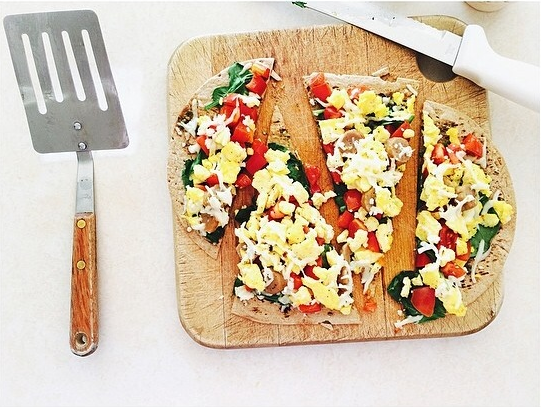 Ever craving pizza…for breakfast? You’re not alone. I sure was after a hard morning workout so I pulled out my favorite Harvest Wheat Flatoutbread Wrap and breakfastized it (yes, I just made up that verb). Place wrap on a baking sheet and bake in the oven for a few minutes just to warm. Meanwhile, dice cherry tomatoes and red peppers to set aside with spinach leaves and cheese. Scramble eggs in a medium frying pan over medium heat. Add in dice tomatoes, peppers. Cook sausage links in a small frying pan over medium heat until fully cooked. Take the wrap out of the oven and evenly spread Wegmans Basil Pesto Sauce along entire wrap. Add spinach leaves. Top with scrambled eggs, tomatoes and peppers. Cut up sausage links and evenly place along pizza. Top it off with as much cheese as your heart desires. Place pizza in the oven and bake for another 5-6 minutes or until sides of the wrap are a bit crispy. Bon appétit! Previous Post If I eat another one of these pancakes, I think I might flip!